Leftovers and tinned foods can be put to good use when it comes to creating winning winter warmers without fuss. Two minute noodles are a great pantry staple. Here, the cooked noodles are combined with fragrant green curry paste, coconut milk and lime juice for a fast and hearty Asian-inspired dish. First get your noodles on to boil (without the flavour sachet). While they are cooking sauté your curry paste in a little oil, add the coconut milk and heat through gently. Add leftover diced or shredded chicken and lime juice. Divide into two bowls and serve sauce over noodles. Heat the oil gently and fry the onion and garlic for until soft. Add the curry paste and stir-fry for a minute before adding the tomatoes and stock. Bring to a simmer, then add the fish. Gently cook until the fish flakes easily. 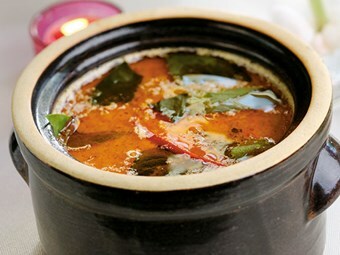 Red curry paste is made from fresh red chillies, with garlic, galanga, lemon grass and Kaffir lime. It is perfect for creating Thai-style meals. This recipe works with meat, fish, tinned lentils or chickpeas — whatever is on hand. Quickly heat the curry paste in a small amount of oil and whisk in the coconut milk. Add salt or fish sauce to taste. Bring to a boil, stirring frequently. Reduce heat and cook a few minutes or until thickened. Add your choice of meats or vegetables for a fast and hearty Thai-style curry.